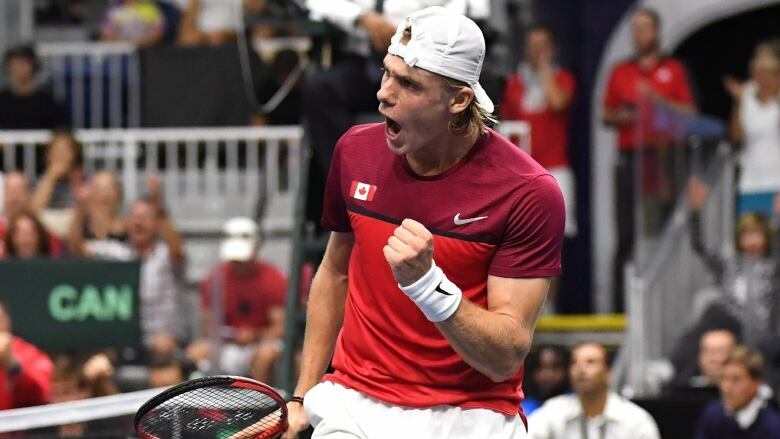 Denis Shapovalov battled back for a five-set win over Robin Haase as Canada took a 2-0 lead versus the Netherlands on Friday night in the second rubber of their Davis Cup draw. Shapovalov, from Richmond Hill, Ont., struggled with his returns in the first two sets, but then re-focused before ultimately beating Haase 3-6, 3-6, 7-5, 6-3, 6-4. The most evenly matched pairing of the five-match international competition, Shapovalov is No. 34 on the ATP Tour's world rankings and Haase is 44th. They were 1-1 in their previous ATP Tour matches. After spraying his returns all over the court for the first two sets, Shapovalov seemed more focused in the third. Shapovalov saved several points before an overhead smash that Haase didn't even swing at gave him the third set, bringing the partisan Canadian crowd to its feet. That momentum carried over to the fourth set, with Shapovalov's serve rounding into form. He blasted an ace past Haase for the set point, taking his total up to four aces in the set, when he had combined for seven in his previous three. Shapovalov fell behind in the tightly contested fifth set, trailing three games to one but took back-to-back games to tie it. Haase took a 4-3 lead but the 19-year-old Canadian came right back, winning the next quickly. He took his first lead of the set, 5-4, when Haase's return went into the net. He then put away the match with a strong return down the line that Haase stopped short on. Shapovalov's win came after Milos Raonic manhandled No. 236 Thiemo de Bakker in three sets to give Canada a 1-0 lead in the first rubber of the draw. Raonic overpowered de Bakker 6-3, 6-2, 6-2, relying on his big serve for 23 aces to the Dutchman's three. Raonic was reluctant to say he gave Canada any sort of momentum with his victory. "Maybe it does set the tone in some ways, but as much as this is a team event, once you step out on the court you're there trying to figure out your own things," said Raonic, who is the top-ranked Canadian on the ATP Tour, rising up to No. 20 worldwide after his run to the fourth round at the U.S. Open at the start of September. "Tennis, no matter what, will be an individual sport other than doubles. Those things don't change." 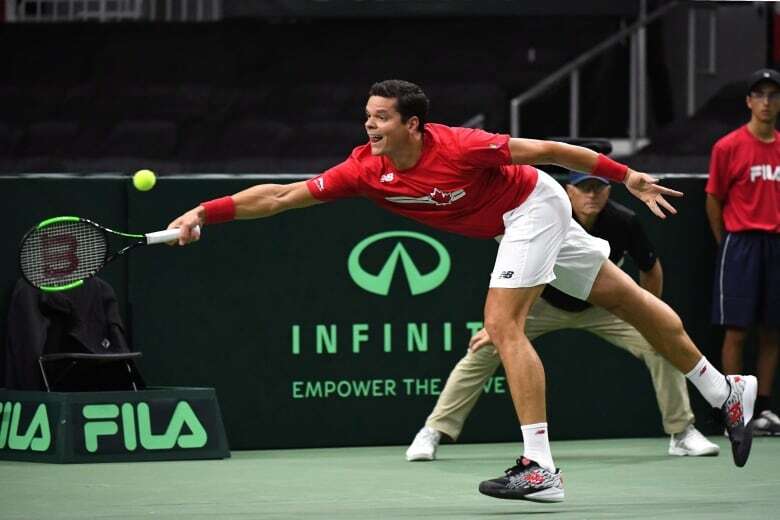 Raonic missed every Davis Cup tie since 2015's 3-2 win over Japan in Vancouver due to injury and his inclusion on the team has helped make it what many have touted as Canada's best-ever Davis Cup entry. Despite that long layoff from the international competition, he improved to 11-1 when playing on home soil in the Davis Cup. Played in Coca-Cola Coliseum at Toronto's Exhibition Place, home of the American Hockey League's Toronto Marlies, the hard-court match had a hockey atmosphere. Fans wore red and white, waved Canadian flags, banged drums, and clapped thundersticks together during stoppages in play. Several times the chair umpire had to ask fans to quiet down with a terse "please," or "thank you." In the fourth set of Shapovalov's match against Haase the chair umpire had to threaten a fan with ejection when he kept making noise during the players' serves. "I think this event, here, has very unique possibilities," said Raonic, who is from Thornhill, Ont., a suburb north of Toronto. "I think if you look at the outer population of Toronto, with the suburbs included, I think there's almost a quarter of Canada's population living here. "I think there's a very big opportunity for people to come out and support tennis." Toronto's Daniel Nestor and Vancouver's Vasek Pospisil will team up on Saturday in the doubles rubber, facing Matwe Middelkoop and Jean-Julien Rojer. The singles matchups will flip on Sunday, with Raonic playing Haase and Shapovalov taking on de Bakker.